The old town of Dubrovnik or the “Pearl of the Mediterranean" might be small in size, but is enormous in popularity, especially among cruisers. Some of the world's biggest yachts have stayed overnight here. Dubrovnik is one of the best preserved medieval cities with a rich history. During the Renaissance, it was one of the wealthiest cities at the Adriatic. 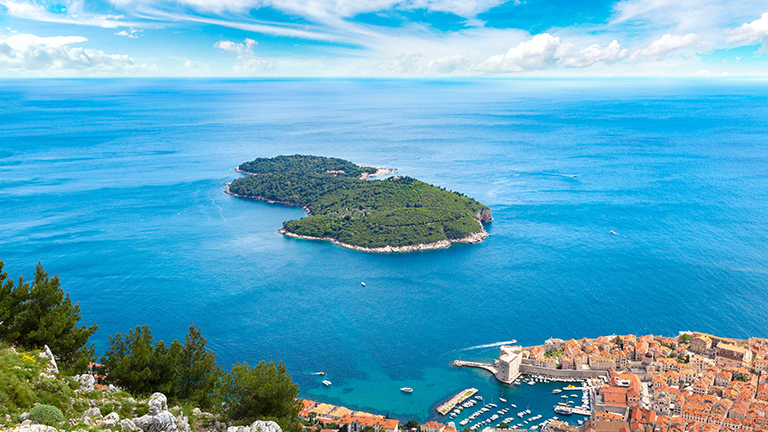 Charter a yacht in Dubrovnik to sail along the calm, crystal clear waters and discover the untouched, wild nature outside its fortified city walls. Sailing in the Dubrovnik region you will encounter some of the most amazing landscapes in Croatia. 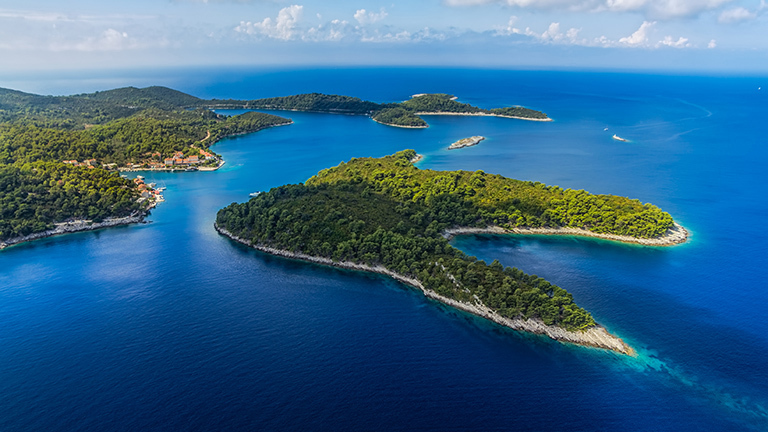 Whether you have chosen a skippered yacht charter or a bareboat charter, head north to some of the greenest Croatian islands like Mljet or Lopud. Dolphins can often be seen on this route. 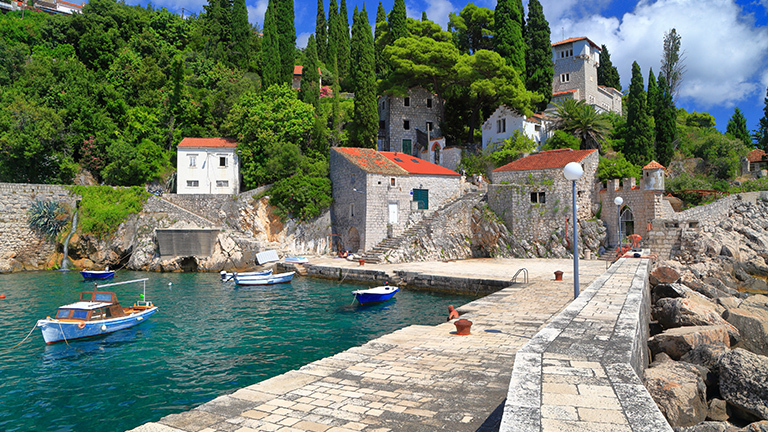 You can also sail south to another beautiful Mediterranean country – Montenegro. Just be aware of the fact that, during the peak of the season, Dubrovnik tends to be a little overcrowded in marinas and ports so book a berth in advance. Early in the morning we will immediately set sail for the old harbor of Dubrovnik. This magnificent city, enclosed by stone walls, was an independent republic up to Napoleon’s arrival. Established in the 7th century, it flourished during the 15th and 16th centuries thanks to achievements in trade, a powerful fleet and successful diplomacy. 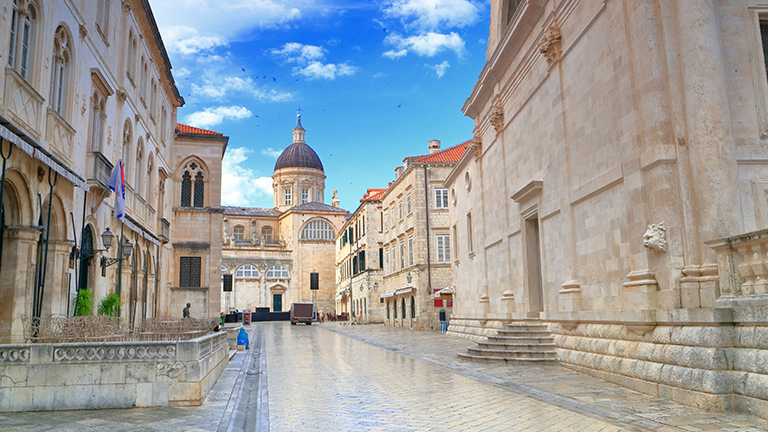 With its impeccably preserved the Stradun street, seventeen churches, Orlando’s Column, Onofrio’s Fountain, and the oldest synagogue in Europe, Dubrovnik is a unique city – not just in the Mediterranean, but in the world. This city, Croatian Athens, has been home to many eminent figures: mathematician Ruđer Bošković, poet Ivan Gundulić, playwright Marin Držić and many more. Situated at the foot of the Srđ hill, Dubrovnik preserves its history and cultural heritage, and cherishes its past glory. All this is shared with numerous visitors, whether they are traveling writers, explorers, artists or simply curious tourists. There are numerous cultural events taking place throughout the year, but none greater that the famous “Dubrovačke ljetne igre”, a summer festival that fills the streets with music, dance and theater, with the flag Libertas proudly waving above the crowds. Indeed, freedom has always been considered by the people of Dubrovnik to be a crucial condition of existence and this can be felt even today. Leaving the crowds in the city, a nearby retreat is a small and lush islet of Lokrum (0,8 km2). Benedictine monks built a monastery here and made the island an oasis of beauty. The visitors can get a splendid view of Dubrovnik from the Napoleon’s fortress, Fort Royal. The island of Šipan, northwest of the city, was a popular place for resting and relaxation in ancient times. Fertile land, Mediterranean vegetation and numerous coves attracted wealthy people from Dubrovnik to build their summer houses here. The small island of Koločep is mentioned in the 1272 Statute of the Town of Dubrovnik. Many nature lovers continue to admire it by visiting the wonderful sand beach in Donje Čelo. The amenities of the civilization and the charm of untouched nature are combined on the island, making it an ideal place for a holiday. 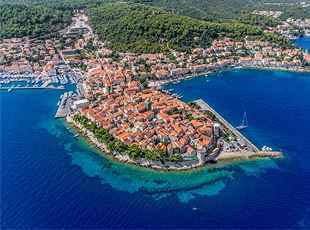 The sailing yacht will then bring us to Korčula which is, without a doubt, among the most attractive islands of the Mediterranean, and not only because of its natural beauty and indented coastline. 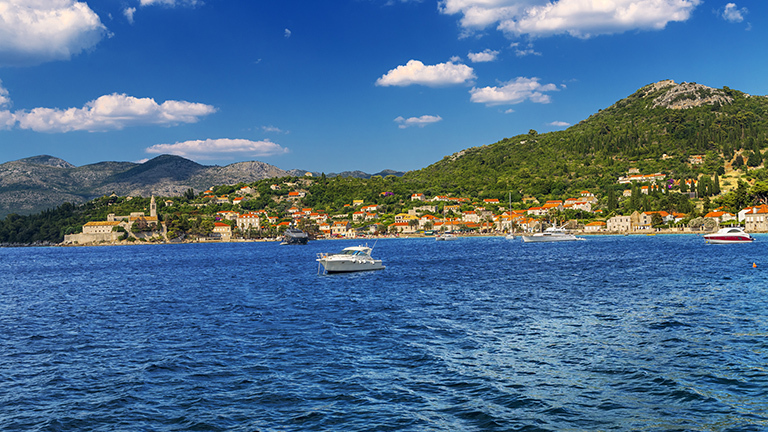 Approaching the town of Korčula, claimed to be the birthplace of Marco Polo, allows for a spectacular sight from the sea. Aside from the many cultural and historical attractions, the island is known for the traditional sword dance Moreška in which the Black and the White King fight for the favor of the Lady. 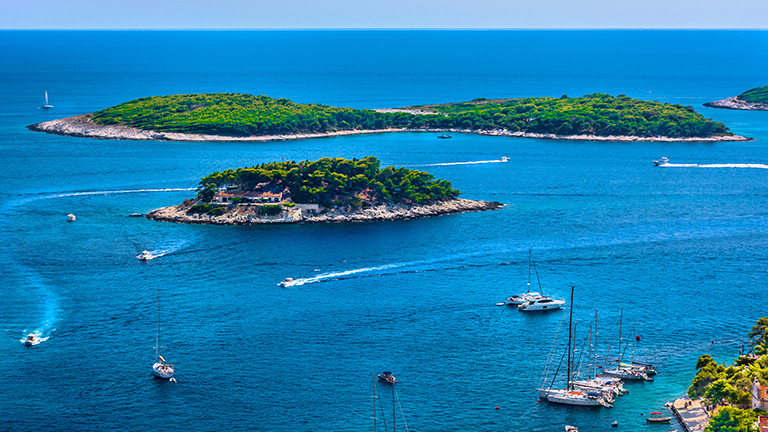 To continue our trip, we will set sail for the Paklinski Islands, an archipelago of twenty one islands in the local waters of Hvar. Other than swimming, scuba divers can discover the secrets concealed under the waves around the islands. 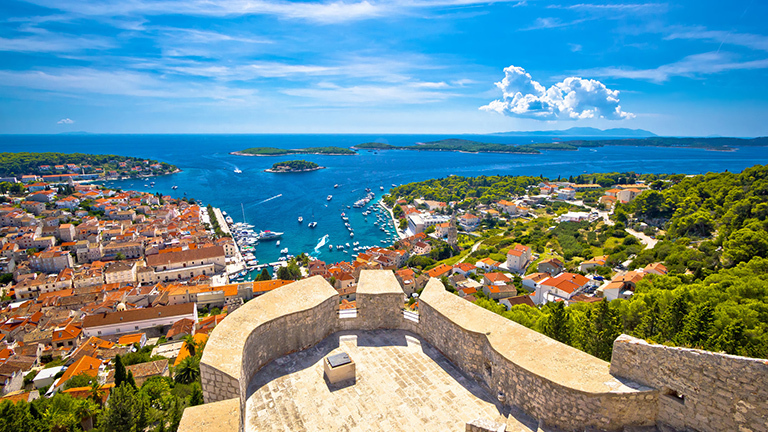 The town of Hvar is located on the southwestern coast of the Hvar island and is protected from the open sea by the Paklinski Islands archipelago. Hvar is well-known for its blooming fields of purple lavender. Monuments such as the Arsenal, town theater, and the Franciscan monastery bear witness of the town’s rulers: Venice, Austria, Napoleon’s France, and evoke Hvar’s glorious past. Authors from Hvar were prominent for the Croatian Renaissance literature, and its theater is the oldest municipal theater in Europe. Exceptionally good climate and excellent location have made Hvar one of the most exclusive and popular destinations in the Adriatic. From Hvar we sail towards Pomena, a small harbor on the west coast of the Mljet island which, according to a legend, is the mythical Ogygia of Odysseus. Only a small number of people inhabits the island, working as farmers, fishermen and in tourism. The western part of the island has been proclaimed a national park. There are two lakes in this area, Veliko and Malo jezero. In Veliko jezero, there is a small island of Sveta Marija on which Benedictine monks built a monastery in the 12th century. With the welcoming shadows of the pine forest, the song of crickets and the unforgettable sunset, we will wait for the evening. 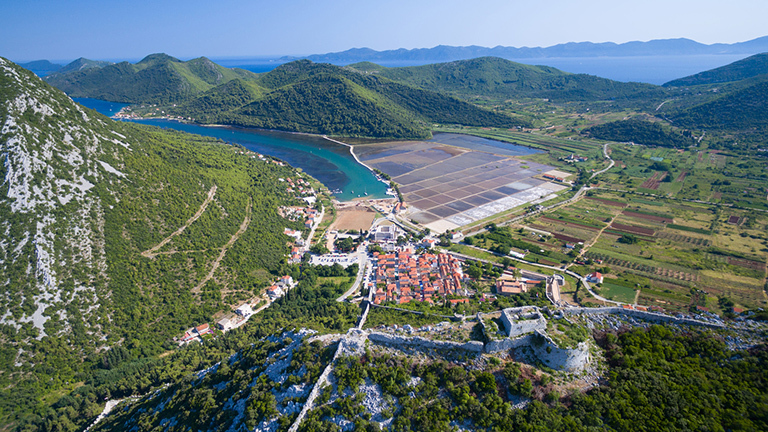 Ston, situated at the only entrance to the Pelješac peninsula, is worth visiting, if for no other reason, then for the delicious oysters that are farmed there. You will be amazed by the town’s fortress walls (the longest in Europe), its fascinating history and, of course, splendid beaches in the area. The bay of Prapratno is a heaven for campers and all those wishing to swim or be involved in water sports. Trsteno, in Dubrovnik area, is known primarily for its Arboretum. The building dates from as early as the 15th century when it was constructed as a summer home of the wealthy Gučetić family from Dubrovnik. The Arboretum is divided into old Gothic-Renaissance gardens and the more recent Neo-Romantic park in Drvarica, dating back to the 19th century, but which unfortunately suffered damage during the war in 1991. We will now steer the bow of the boat towards our port of origin. Early in the morning, we will immediately sail towards Pomena, a small harbor on the west coast of the Mljet island which, according to a legend, is the mythical Ogygia of Odysseus. Only a small number of people inhabits the island, working as farmers, fishermen and in tourism. The western part of the island has been proclaimed a national park. There are two lakes in this area, Veliko and Malo jezero. In Veliko jezero, there is a small island of Sveta Marija on which Benedictine monks built a monastery in the 12th century. With the welcoming shadows of a pine forest, the song of crickets and the unforgettable sunsets, we will wait for the evening. The sailing yacht now takes you towards Lastovo, an island surrounded by 46 small islets and blessed with clean sea abundant with fish and lobsters. It is an island of outstanding natural beauty, with ancient pine forests and a flourishing flora and fauna. For four centuries, Lastovo has preserved its traditional feast Poklad which celebrates the help of St. George in the island’s successful defense against the conquerors. The next destination is the small island of Proizd opposite Vela Luka on the Korčula island. Proizd is the pearl of the Vela Luka archipelago, distinguished by its deep blue waters, white cliffs and luxuriant Mediterranean vegetation. Nudist beaches offer a combination of nature and freedom of body and soul. 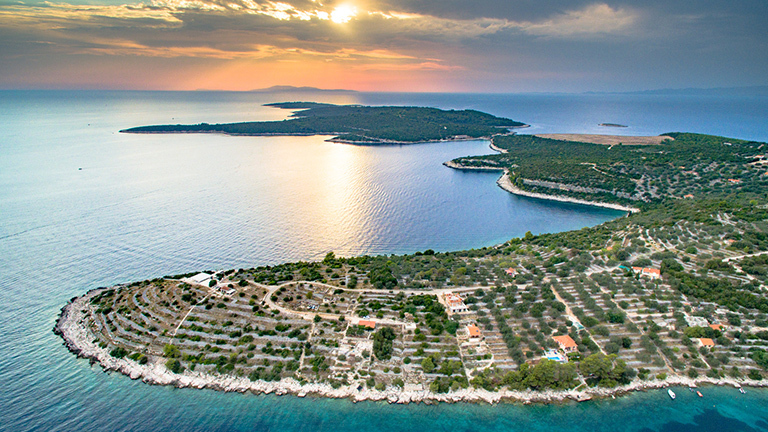 If you decide to visit Vela Luka, you will get to know a very attractive and small island town whose residents are involved in tourism, ship-building, fishing, sailing and farming. They love to work, but also sing and dance. Through hard work of its inhabitants, Vela Luka has become a settlement in which you can enjoy superior wines and olive oil, see the most modern achievements of ship-building, hear a real Dalmatian song, visit an exhibition of renowned artists and, among many other things, admire the untouched natural beauty, both above and below the sea. The town of Hvar is located on the southwestern coast of the Hvar island and is protected from the open sea by the Paklinski Islands archipelago. Hvar is well-known for its blooming fields of purple lavender. 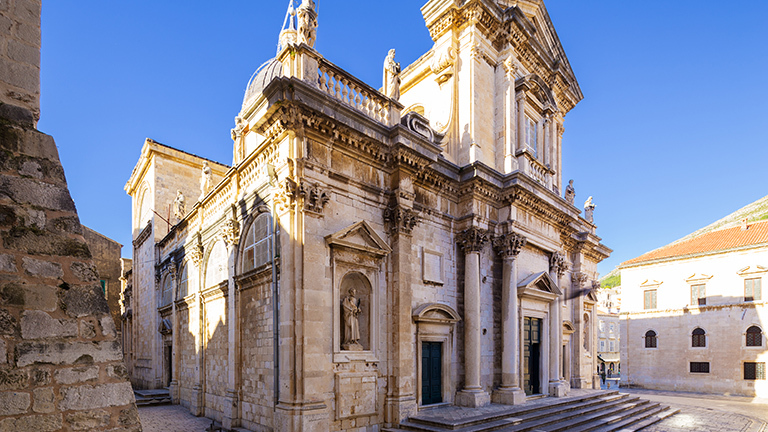 Monuments such as the Arsenal, town theater and a Franciscan monastery bear witness of the town’s rulers: Venice, Austria, Napoleon’s France, and evoke Hvar’s glorious past. Authors from Hvar were prominent for the Croatian Renaissance literature, and its theater is the oldest municipal theater in Europe. Exceptionally good climate and excellent location have made Hvar one of the most exclusive and popular destinations in the Adriatic. 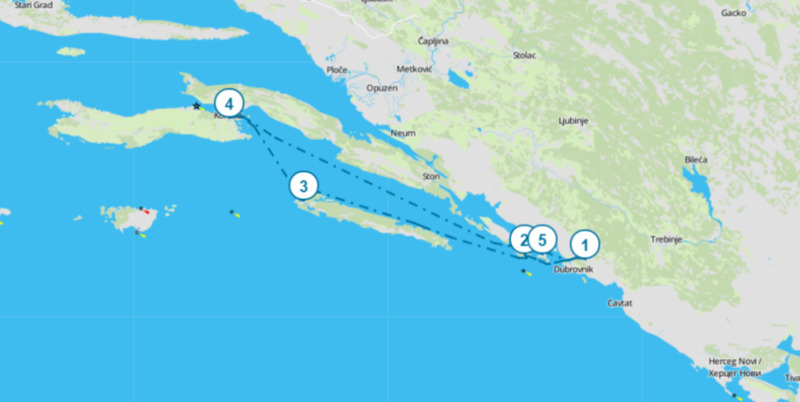 With a favorable wind, our sail will carry us south to Šćedro, a small island dotted with quiet beaches, where you can remain undisturbed and enjoy swimming and soaking up the sun. 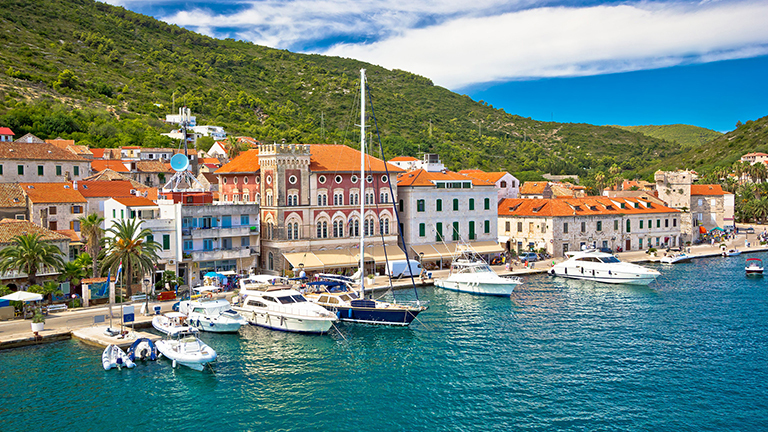 The sailing yacht will then bring us to Korčula which is, without a doubt, among the most attractive islands of the Mediterranean, and not only because of its natural beauty and an indented coastline. Approaching the town of Korčula, claimed to be the birthplace of Marco Polo, you will have a spectacular sight from the sea. Aside from many cultural and historical attractions, the island is known for the traditional sword dance Moreška in which the Black and the White King fight for the favor of the Lady. Trsteno, in Dubrovnik area, is known primarily for its Arboretum. The building dates from as early as the 15th century when it was constructed as a summer home of the wealthy Gučetić family from Dubrovnik. The Arboretum is divided into old Gothic-Renaissance gardens and the more recent Neo-Romantic park in Drvarica, which dates back to the 19th century, but which unfortunately suffered damage during the war in 1991. Early in the morning we will immediately set sail for the old harbor of Dubrovnik. This magnificent city, enclosed by stone walls, was an independent republic up to Napoleon’s arrival. Established in the 7th century, it flourished during the 15th and 16th centuries thanks to achievements in trade, a powerful fleet and successful diplomacy. 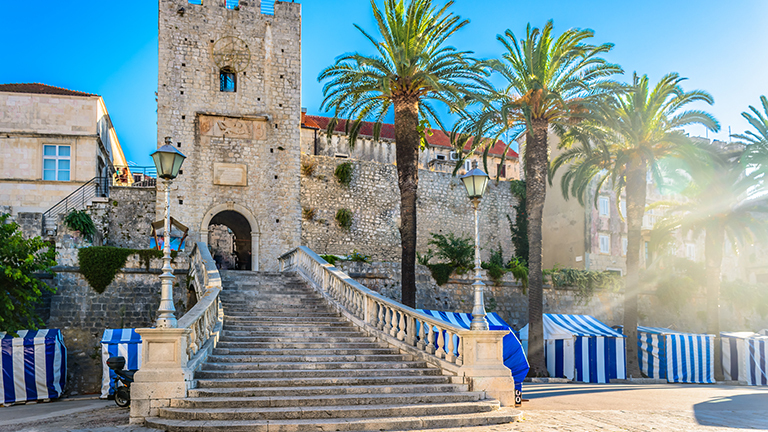 With its impeccably preserved Stradun street, seventeen churches, Orlando’s Column, Onofrio’s Fountain, and the oldest synagogue in Europe, Dubrovnik is a unique city – not just in the Mediterranean, but in the world. When you have finished with the check-in process and buying groceries for your yacht, it is time to set the sails and leave Dubrovnik. 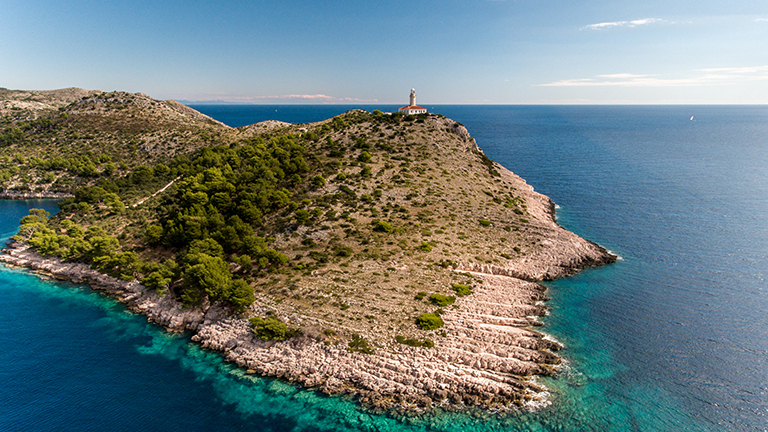 Some 15 nautical miles northwest of ACI Marina Dubrovnik lies the island of Šipan. 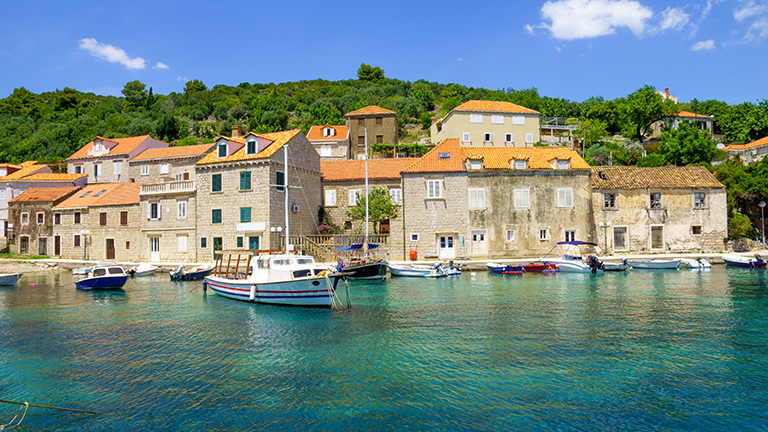 Šipan is a part of the Elaphiti Islands archipelago and is a favorite leisure destination in Dubrovnik region. The bay of Šipanska Luka provides a safe anchorage despite the muddy seabed, because this spot is pretty well-protected from all winds. You can also count on several berths on the city waterfront, while konoba (tavern) Kod Marka can offer you a buoy along with delicious authentic Dalmatian dinner. Booking in advance is mandatory. Fresh fruits, vegetables, fish and local specialties are available early in the morning on a small market in the center of the village. For those who do not like cooking on board, fine breakfast is served at Villa Dubravka. A relaxed morning or evening walk around Šipanska Luka brings you back to time when the nobility from Dubrovnik enjoyed their free time in their medieval mansions. 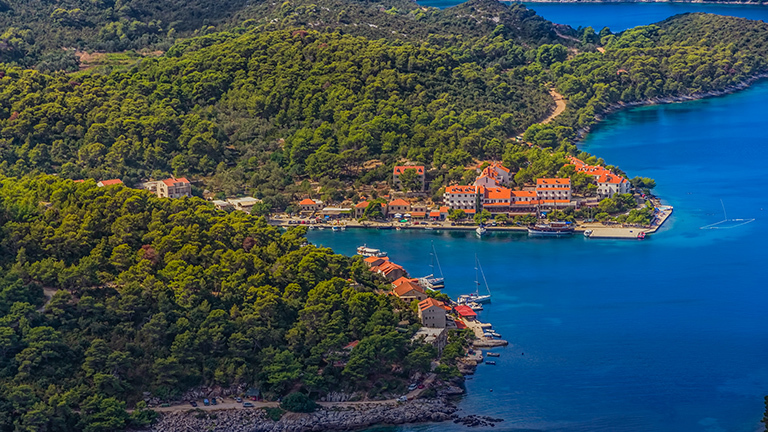 Keep to the northwestern coast and sail along the channel between the Mljet island and the Pelješac peninsula. 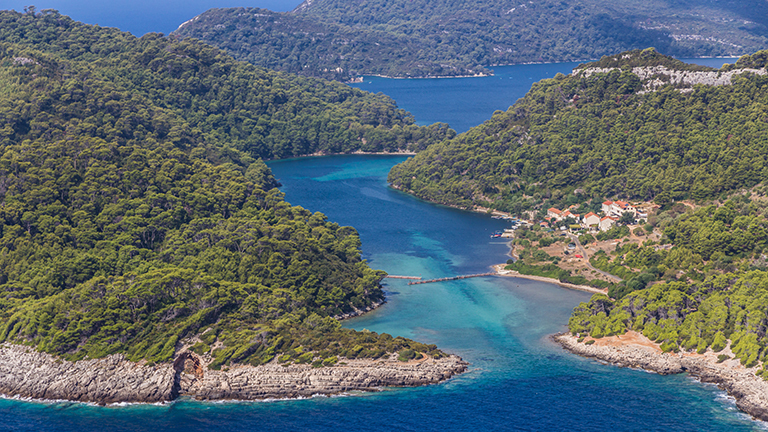 After some 25 nautical miles you will reach a nice village called Pomena on Mljet. Safe and comfortable berths can be found on the waterfront of Hotel Odisej with safe mooring, fresh water and electricity. Taverns in the village offer delicious seafood and homemade wine. 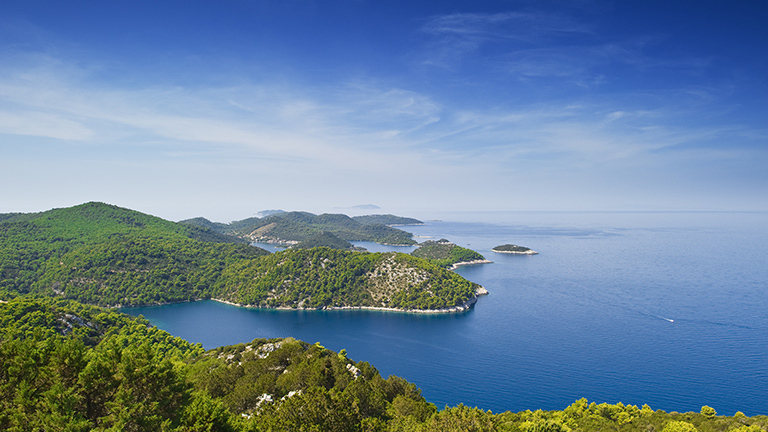 Walking or cycling to the Mljet National Park is a must. 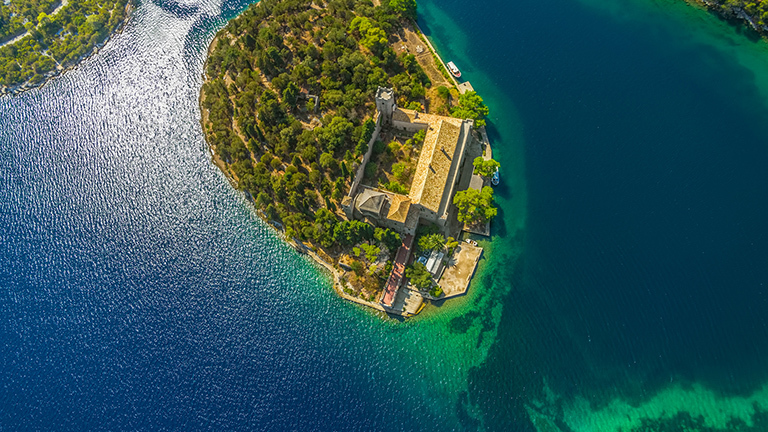 The beautiful island of Korčula lies at a small distance from Pomena. 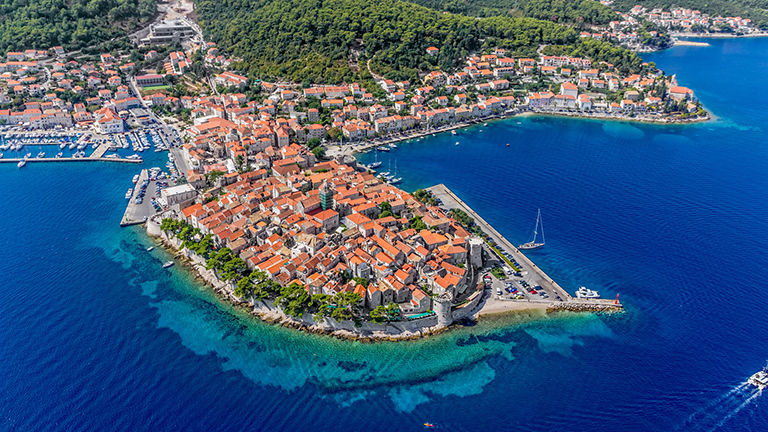 Safe berths in Korčula town are located in ACI Marina Korčula at the very center of the town. Another option is to berth in Marina Lumbarda, less than 3 nautical miles south of Korčula town. 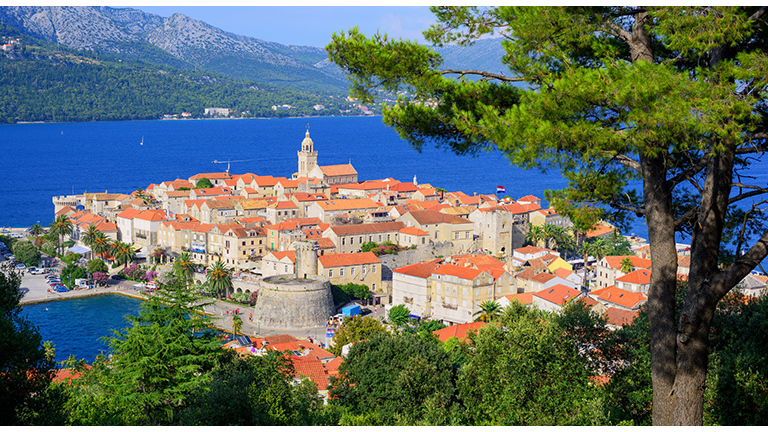 It takes just a short bus or taxi drive to reach Korčula from Lumbarda. The old town core of Korčula is an open-air museum with its city walls made of stone, tiny streets and many art shops and taverns. 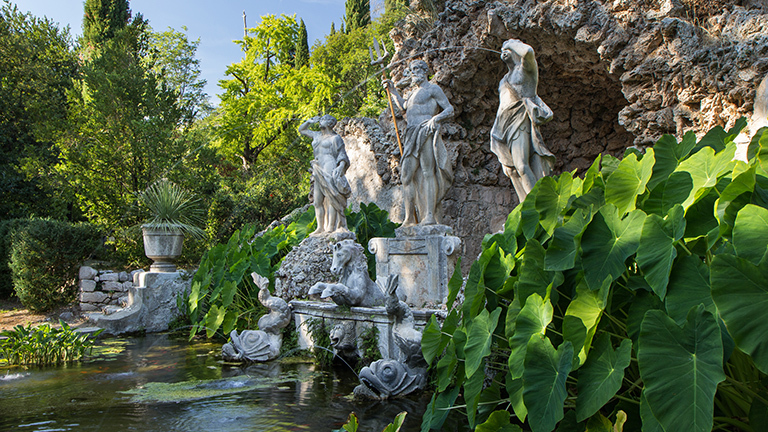 It is also an alleged birthplace of the famous voyager and explorer Marco Polo. Nighttime lovers can start their night at Fish’N’Go cocktail bar just across the marina and continue the night at one of the town’s numerous taverns or enjoy good jazz sounds at Servantes or Akademija bar. An open-air dancing floor and several night bars are also in the vicinity. 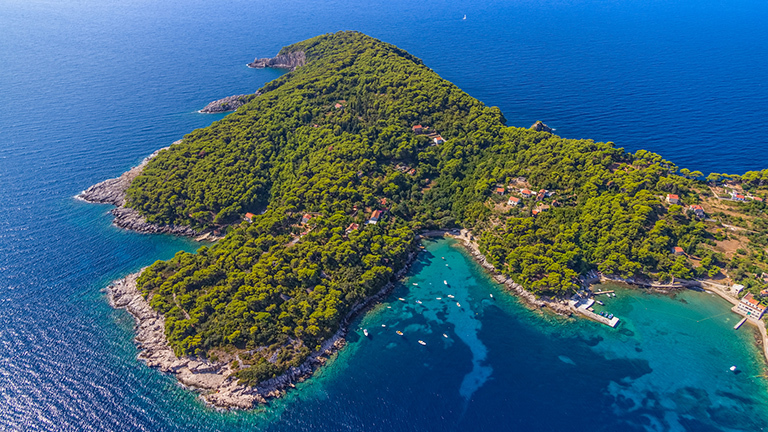 We suggest you spend this day exploring the archipelago of the Lastovo island. Allow yourself some lazy hours anchored in one of its numerous coves and enjoy swimming and snorkeling in turquoise waters. Do not be surprised by a visit from rangers because the entire area is declared a natural park. 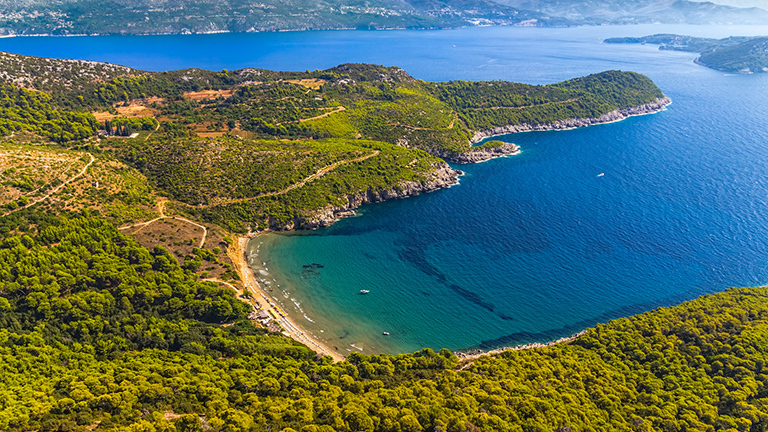 Good anchorage and safe berths are available at the Skrivena Luka bay on the south side of the island. The name of this bay, literally translated from the Croatian, means “hidden port” – a definite proof that this is a safe place. A visit to the Struga lighthouse on the south side of the Bay is recommended for the beauty of the view, especially the sunset. Suggested destination for gourmands would be Konoba Santor at the Zaklopatica bay on the northern side of the island. It is time to leave the open sea and get closer to the mainland, but not too fast. Let’s visit the island of Vis first. The port of Vis is located in a wide bay and provides more than enough berths on the waterfront, as well as numerous buoys within the bay. 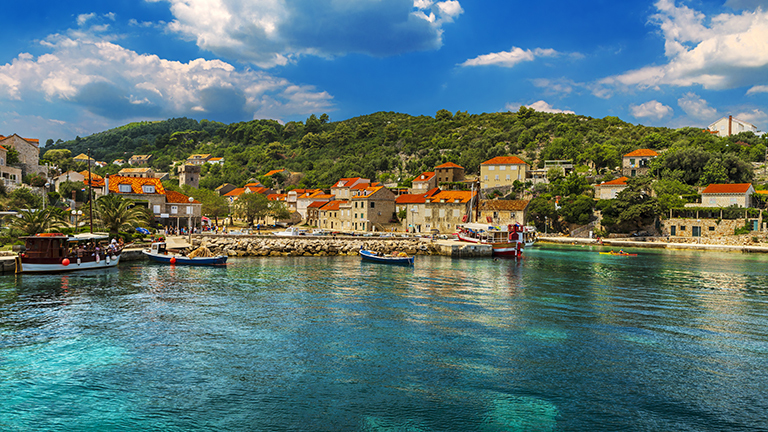 Before entering the port, you can take a swim break in the nearby Stončica Bay just next to a mighty lighthouse. The nightlife in Vis is the most vibrant in Fort George night club located in the medieval fortress on the west side of the Vis harbor. You can also visit the inner part of the island to explore genuine gastronomic and wine offer of the island. Some would say that dessert comes at the end of the trip, so the last destination before reaching the base would be the town of Hvar. It is a gem among the Central Dalmatian islands and the absolute summer hotspot. 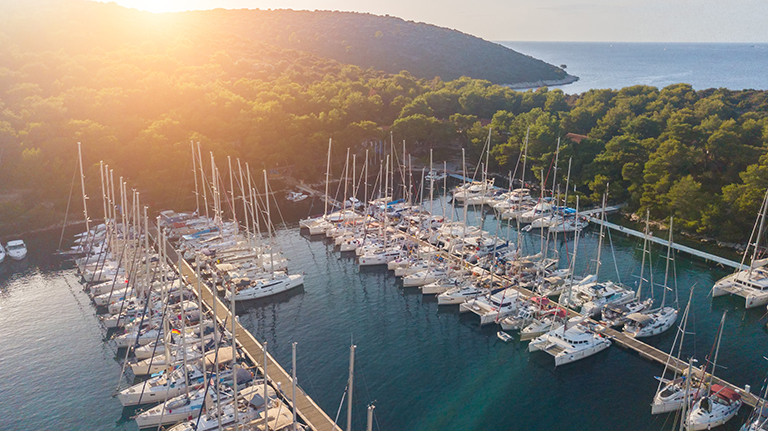 Since the town port is very busy during the season, it is recommended to book your berth in advance, though it is much more pleasant to dock your yacht in ACI Marina Palmižana on the Paklinski Islands, just across the Hvar town. Transfer to the port is well organized by fast motorboat shuttles. You can spend the day swimming, snorkeling and sunbathing anchored in one of the coves on the Paklinski Islands. In the evening, you can come to Hvar. The town abounds with taverns and restaurants, and is suitable for every kind of visitors. 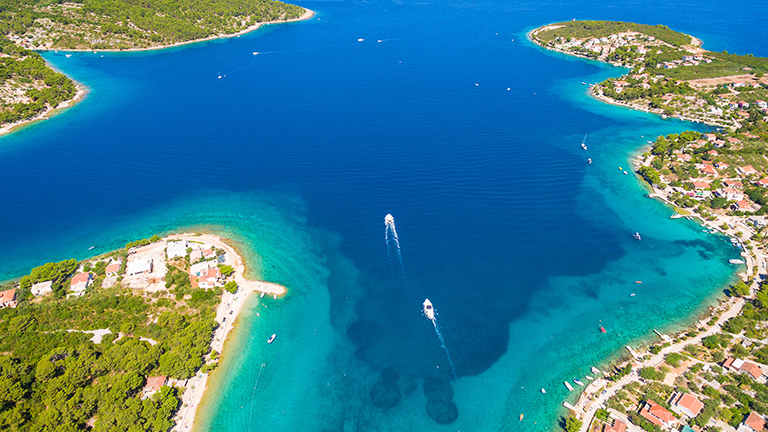 From low-budget to exclusive parties, fun never ends in Hvar. During the day, you can enjoy in Hula Hula Hvar beach bar. After that, you can move to Carpe Diem in the Stipanska bay on the Paklinski Islands. The last day on this one-way trip ends in our base in Rogač on the island of Šolta. Prior to arriving to Rogač, you can take a nice swim break in the Livka bay on the southeast end of Šolta or in Nečujam just next to Rogač. Fine bites are served at Konoba Pasarela close to the base. Also, transfer to Maslinica can be organized if you want to spend the night in the tiny and calm fishermen village, where a medieval fortress and a monastery have been refurbished and turned into an exclusive hotel with a nice marina. Ask for more information at the office in our base. Rogač is connected with Split by ferry and catamaran lines. We can organize transport to the Split Airport by a speedboat, or from the Split bus terminal which is located just a few steps away from the Split Port. Interested in Sailing Holiday in Dubrovnik Region?